Cassandra's Legacy: Long live Italy! Can the "sun country" reach one million photovoltaic plants? Long live Italy! Can the "sun country" reach one million photovoltaic plants? 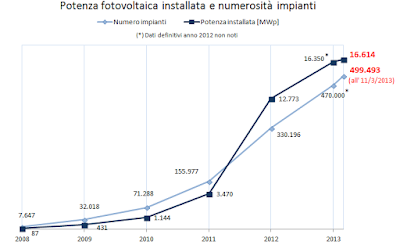 Despite the unabated economic disaster, despite unemployment, bureaucracy, overtaxation, bad government, corruption, mafia, and all the rest, Italians are reacting at least in one field: in renewable energy, especially photovoltaic energy. You can see the trends in Italy in the image below (from assoelettrica). 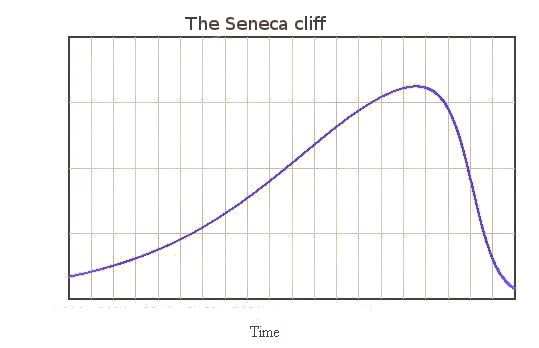 Note how the number of plants is growing more rapidly than the installed power, indicating the trend toward small plants. In 2013, the number of installed plants had gone over half a million and, little more than one year later, Italy had already reached the number of 650,000 plants. But the actual number of plants is surely larger, as we need to take into account all the plants that are not connected to the grid; for self-sufficiency or for mobile applications. And we should also count all the micro-applications where PV panels are used to power such things as street signs and the like. So: does Italy have one million PV plants? Probably not yet, but the growth continues unabated and we are rapidly getting there. 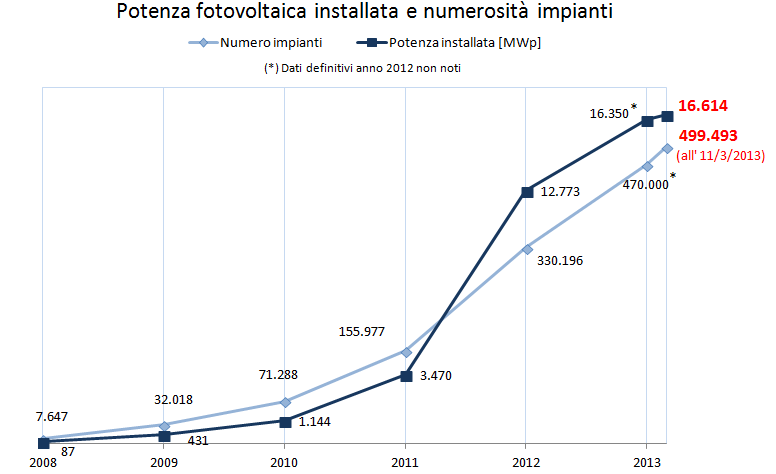 The interesting point is that this growth is occurring despite the evident (and partially successful) attempt on the part of the government to kill the Italian PV system (*). They succeeded in stopping the growth of large plants, but Italians reacted by invested in small plants, and a lot of them. The consequences are impressive, likely very different than what the government (and the fossil fuel lobby supporting it) had in mind. With so many plants, PV is becoming entrenched in the economic and social fabric of the country. One million small plants mean that at least 3-4 million people are directly connected and benefitting from a PV plant they own, or they use. They won't take so lightly the attempt of anyone to take those plants away from them. That has political consequences that shouldn't be underestimated. Indeed, some signs seem to indicate that the anti-PV campaign of the Renzi government is losing steam. Eventually, it may fold up and disappear altogether (and I don't mean just the anti-PV campaign). So, Italy is living up to its fame of "sun country". 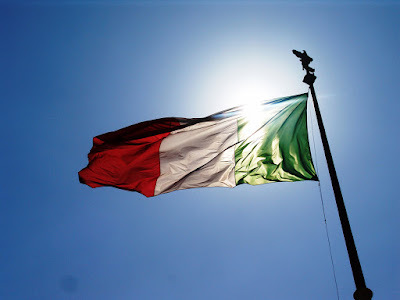 Long live Italy!! (*) Obviously, there are no more incentives from the state for new PV plants in Italy; but this is not an obstacle since the lowered price of PV has made them unnecessary. However, what the government has been doing is a policy of positively discouraging new plants, as well as trying to kill the existing ones by a combination of overtaxation and overregulation. The last attempt in this action is the proposed law that establishes a flat fee for the connection of a home to the grid - instead of the current one; proportional to consumption. In this way, even if a PV plant produces 99% of the owner's need, the owner still has to pay a hefty fee to the government owned energy producer. Of course, then owners could react by disconnecting from the grid and storing energy in batteries; but then the government could react like the Spanish government has done: flatly forbidding PV plants not connected to the grid. In short, it is a war. We will win it, but we have to fight it. 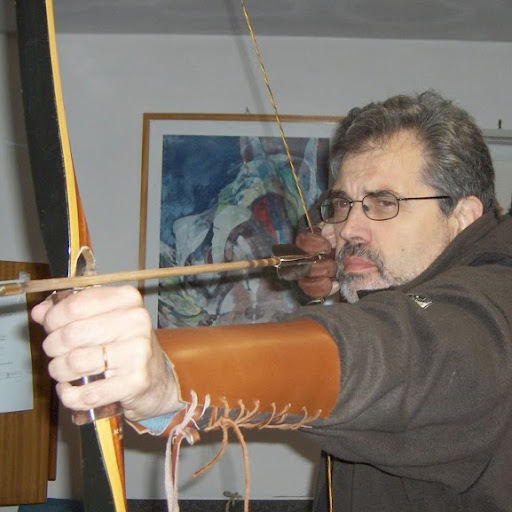 Following the imposed "technocratic government' (austerity) Italy has Mario Renzi as PM with a coalition government of the 'Centre Left' where Renzi is seen as a 'Third Way' politician and has publicly expressed his opinion of Tony Blair as an 'inspiration'. ""That climate change - said the prime minister - is the challenge of our time, the science says, there is no time to lose: the policy must do its part." "Our children - continued Renzi - expect that in Paris the agreement is binding and that the jobs of the green economy are real." For this, he assured [as] the prime minister, "Italy is ready to contribute a substantial budget to the green fund of the United Nations". Renzi also stressed "the important work of the EU with the aim of reaching the goal in 2020 but, by 2030, to a -40% of greenhouse gas emissions compared to 1990 levels by 2050 and to a reduction of 80-90% compared to 1990 levels. " How do you judge distributed solar electricity generation in the mix of approaches to achieving such goals? Rather weirdly in Britain considering its low solar input, (i.e. almost zero in much of the winter in the northern half of the country) government announced changes in policy so that it looks as though we will switch more to 'rooftop' fairly small scale PV (farmers in the South were renting their fields to PV companies), but closing the options for more land-based wind turbine generation. We have a lot of wind in the North, especially in winter. The 'carbon wars' have some strange convolutions especially in the world of 'political triangulation'. For the European citizen this is the ‘world’ of the ATM and the 'supermarket' retail chain, and beneath us the 'abyss' of losing access to the personal motor car, or finding ourselves in sudden need of a ‘Food bank’. It could get stranger and a lot worse, but 'Long live sunny Italy'! I hope your supplies of water are secure for the foreseeable future. I guess households can play a part, even in this vital measure. Renzi was propelled to the role of prime minister by a combination of interests which included an explicit intention to kill the Italian PV industry and to revive the agonizing fossil fuel industry by means of financial and legislative support. He has been doing exactly that and what he said, says, or will say to the United Nations is pure background noise. Governments in general are evil entities. So, why does the British government support PV and try to kill Wind? Probably it is just because of that: they are evil; they are followers of the Wizard Sauron or maybe of the pernicious sect of the pendulous salami rod. How can we say? In terms of water, anyway, Italy is not in such a bad shape. Just in case, however, I have been working on a project designed to transfor solar electricity into water. It works! I suppose there is a 'science' of gestures and some of us are 'wizard' at it. Yes, some of the old aqueducts survived for more than a millennium as civic structures through the last Really Big Recession. PS I take the 'Carbon Wars' seriously - I met Jeremy Leggett and thanked him for his account of the British version of an early phase a while back. "In terms of water, anyway, Italy is not in such a bad shape. Just in case, however, I have been working on a project designed to transfor solar electricity into water. It works!" Could you please tell us more? In short, it is a war. We will win it, but we have to fight it. This is the key message, that the media has been trying to suppress. PV can supply a sizeable amount of electricity consumption in much of Europe for a considerably cheaper price vis-a-vis grid rates. In Italy the cost of the electricity generated by a self-consumption system with Li-ion batteries back up is certainly below 0.15 €/kWh.